I’ve read all of the books in this series and recommend that you do the same rather than read them out of order. The reason being that the true plot of the story is on-going. 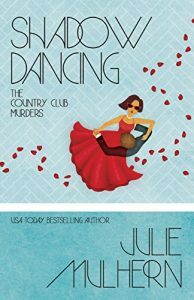 There is action and murders throughout but not anything that specifically needs to have a whodunnit type solution. 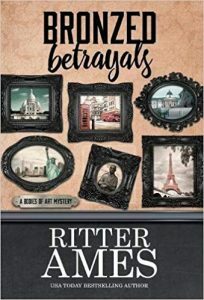 You are generally presented with a crime that one or more individuals from Laurel Beacham’s past (our sleuth) and have to figure out which may be responsible. The designs in this book are inspired by actual greeting cards. 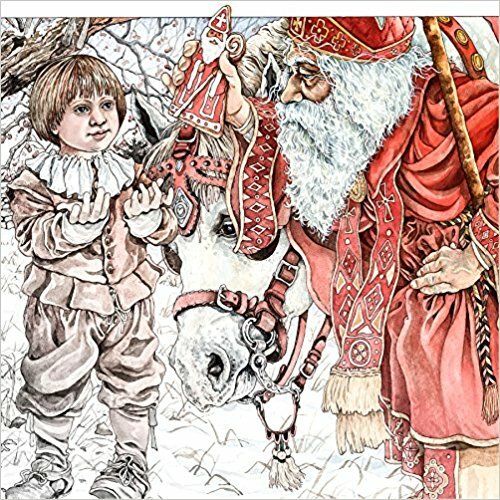 Marty Noble is the illustrator in the book and has interpreted the greeting cards into line art form. The designs are definitely fun and evoke a vintage style Christmas of a kinder and gentler time. There are sweet faced children galore and a variety of images of fun Santa. The designs are not overly detailed. Some of more simple than others. There are a few that contain more detail and should take longer for a colorist to complete. If you decide to purchase this book on Amazon, be sure that you are seeing the cover that shows in this review. Two reasons for that caveat. At the time I write this review, Amazon has combined multiple Marty Noble books together for review and purchase. There isn’t any rhyme or reason for that, just that they did. I tried working with Amazon to get the review pulled apart but it appears that buy-in for splitting improperly combined reviews are spread across their business and some of those groups are resistant to change – even when it is amply merited. Frankly, after spending several months and lots of my time tracking down which books (and there are many more than this) are improperly combined, I decided that Amazon can have their PAID employees do this and not a customer who is simply trying to help. The other reason I mention the cover is that Dover has done an earlier version of this book that is printed on both sides of the page. As coloring medium seeps through their paper, I think having the one side designs makes a lot more sense. I’ve noticed that the paper quality seems to change quite frequently on the Creative Haven line. 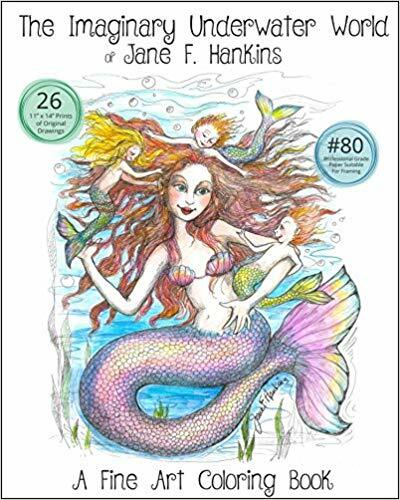 Because of that, if you buy one of their coloring books, it may be slightly smooth or slightly rough depending on when and where it was printed. I’ve found that coloring medium, including pencils, work similarly with both slightly rough and slightly smooth paper from Creative Haven. In this case, my coloring book pages are slightly rough. Quality comes at a premium and this is one of the nicest quality coloring books that I own. Not only are the pages larger than most at 11 x 14 inches, the paper used is #80 professional grade paper. And that is just the nuts and bolts of the book. What is more impressive, to me, is the artwork on each page. 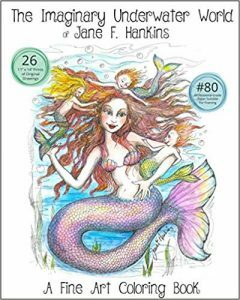 When I first received the book, I thought that it would be filled with pages of mermaids. While there are a few of those designs, the vast majority of the designs are of wildly varying sea creatures. Or I should say, the artist’s interpretation of those sea creatures. From Dog Fish and CatFish to Sea Unicorns and Sea Monkeys to Puffer-up Fish and even the cutest little oysters I have ever seen, the artist has re-interpreted the world of undersea creatures. The book is a premium one and, if you enjoy the artwork, it makes all the difference. The pages are set up to be framed easily with the pages being perforated for easy removal. The designs are detailed and some have some and intricate areas to color. There is abundant shading using crosshatch on some designs – not quite grayscale coloring but definitely more than a simple line drawing. 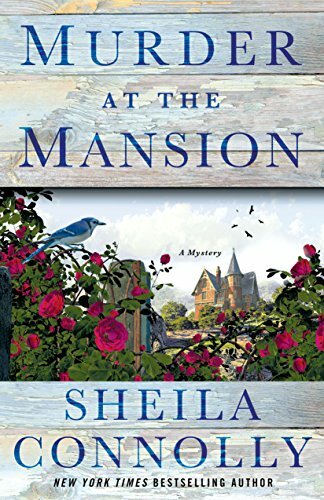 It’s been a number of years since I have read a mystery by Sheila Connolly (I read the Orchard mystery series.) I wasn’t sure how she had progressed as an author in the intervening years but was happy to find that she has grown into her craft. Considering that those earlier books were excellent, it meant that her plot lines and characters have gotten even better than before. 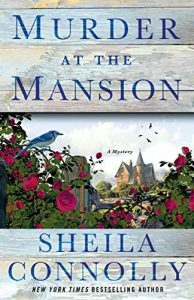 In the debut to this series, Kathleen Hamilton is brought back home again to help save the old hometown. She isn’t the type to look backward but is drawn to both the plight of the town and to the actual project involved. This is the second coloring book I have by artist Chinthaka Herath. The focus is on the female form along with beautiful flowers and animals. As much as I enjoyed the first coloring book by this artist, I am liking this one even more. The females have a strong look to them, kind of like a crusading spirit which appeals to me. There are flowers and jewels and other adornment but, you somehow know that the women in these images are the important part. They stand strong and will continue to stand. One of my favorite images is of a woman in armor with a broadsword. The designs have a nice level of detail. Most have background of a sort included. 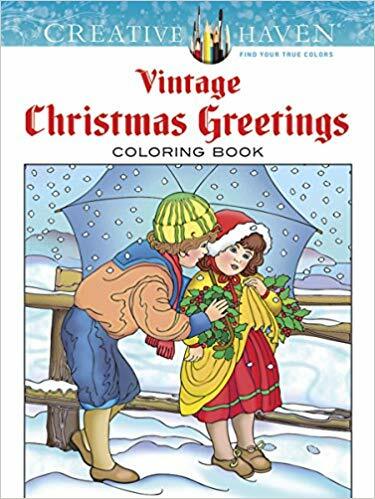 While there are some intricate areas to color, I don’t consider the book to be a difficult one or one which will tax the eyes or force you to use tiny coloring medium. This is the second Nice Little Town to focus on the cute abodes of mice. This first book showed houses which were more in line with traditional cottage forest homes – cute and vintage looking. With this little town, as with all the others, the artist switches things up. These mice have a more modern look to the. They are longer and lankier and wear clothes that might look a little more in line with our times. The mice are having fun. Not only are they out and about in the town, they are at the library or getting a quick tan in the town center. Many of the houses have a theme included rather than a just a change of colors. These last two mouse house coloring books tickle my fancy. 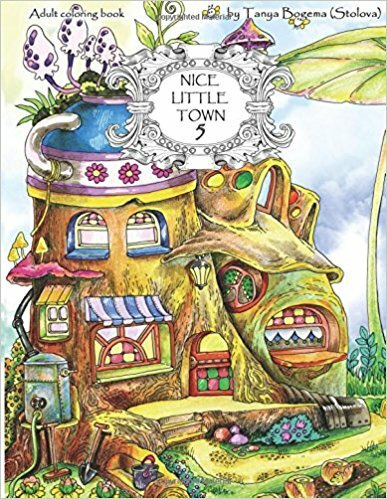 The others houses in the series are set up for people but I wonder if there might someday be birdhouses or houses for trolls or even for bunny rabbits. Really, the choice can be endless if the artist chooses to explore the avenues available. 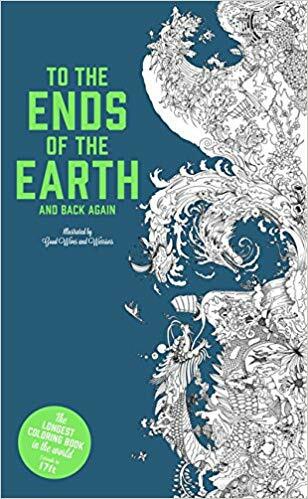 I’m both a fan of this series (which up to now, has been illustrated by Sarah Yoon) and of the artist team Good Wives and Warriors who are the illustrators of this third book in the series. 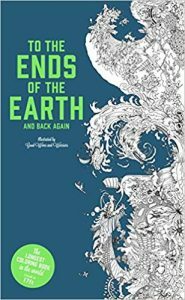 In this book, the continuous page format continues and the trip is across the earth (and back) rather than under the sea or up to the moon. While the format is familiar the artwork is straight up Good Wives and Warriors. 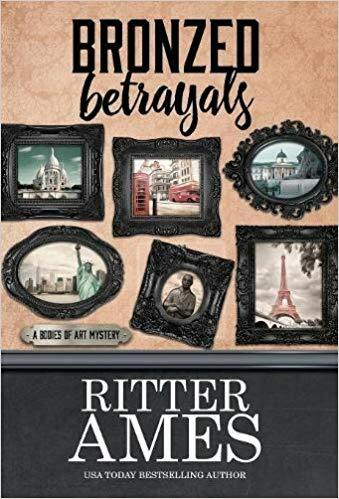 The level of detail is racheted up and style is a little more elegant than flat out cartoon-like and that is what makes this book my favorite in the series. My husband and I share the other books in the series but this one is all for me. In this book, the background is pre-colored in a white to increasingly deeper blue as you head further into the book. The actual designs are black lines on white. I found that the pages are a little to maneuver unless you have a really big area in which you color. I found that folding the pages the opposite direction from they way they came also helped keep the fold-out manageable. 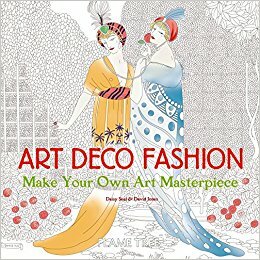 The Art Deco period is one that I really appreciate for fashions and for showing that women of the time were breaking free of the molds that they had been placed in. Gone were the head to toe fashions with outlandish bustles and cinched in waists. The clothing showed women in free and easy poses. They were involved in sports and other activities and dressed for what made it easy for them. There were also beautiful and elegant fashions, especially for evening wear. I can only imagine how the women of the day felt in their new styles of clothes – breathing free and alive to what would come next. There are 45 line drawing designs to color. The designs were chosen by Daisy Seal and were illustrated by David Jones. The original artists are varied and, when possible, attribution is given to them for their original work. This information is on the opposite facing page of each design, and included the name of the original artist, the date and in which magazine et al it was originally published. There is a thumbnail of a small portion of the design with some color showing. 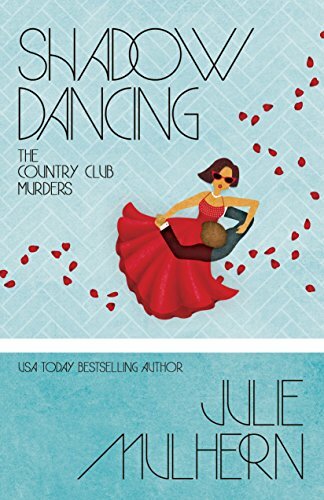 The Country Club Murder series is focused on the 1970’s with country club living at its core. Ellison Russell was born with the silver spoon in her mouth and has been spending the last several years trying get beyond it. Ellison is an up and coming artist whose work regularly sells out, so she has learned the value of money earned for work she has done – something that was missing from her earlier years. In this series, Ellison keeps coming across dead bodies. It is happening with such regularity that her mother (who is country club to the core) is finding life embarrassing. It appears that finding murder victims is not the thing at all in their crowd. 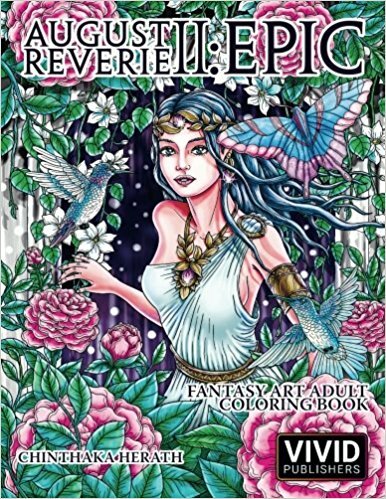 This is a really lovely grayscale coloring book. It is actually a storybook as well. The story has to do with how a baker’s dozen (13 instead of 12) came into being. The story is sweet and the illustrations are really beautiful and done well. Not only with regards to the actual linework but with regards to the shading from light to deep which is imperative for a well-done grayscale book.